Dominiques grew up with America. Hardy survivors, the Dominique can survive a cold, New England winter or the hot, humid summer of the mid-west. Although considered dual purpose, the Dominique excels in egg production laying a steady three, large, brown eggs a week long into the winter months. In colonial days the Dominique fended for themselves as foragers of seeds, insects, and plants. Colonial America valued the Dominique’s feathers as fill for their pillows and mattresses. Dominiques mature quickly. A medium size fowl dresses out as an acceptable three-pound table bird. Broody Dominique hens make good mothers and pets. 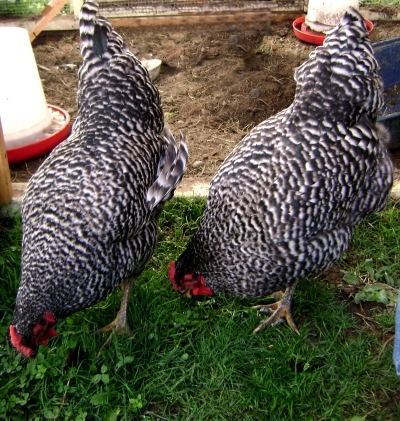 The hens have exceptional success and low mortality rates raising their brood. The female side of the breed has a calm, friendly demeanor. In total contrast Dominique roosters prove contentious and a worthy opponents to predators. Owners have seen roosters kill small cats, snakes, and the invasive but unfortunate mink. Dominiques handle both confinement and free-range foraging equally well. Largely ignored through most of their history, Dominiques exhibit an incredible adaptability to their given environment. Some have described the Dominique as hawk colored in reference to their plumage patterning. They display black barring over their entire white bodies. One owner called the Dominique a fowl of pleasing balance as opposed to one of extremes. They sport medium red combs, wattles, and earlobes on a medium frame. 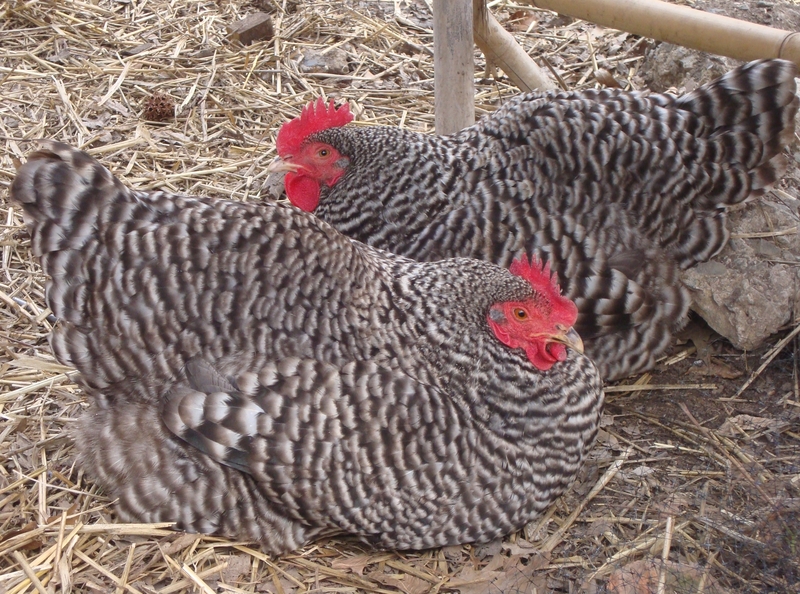 Many confuse the Dominque with the Barred Rock breed. Experts can tell the difference immediately as the Dominque has a red rose comb; whereas, the Barred Rock has a red single comb. Males have a “U” shaped back with an upright tail. Female backs follow a more natural outline sloping down from head to tail. Dominique learned to survive during a time when colonial America had an abundance of wild game. Few paid attention to or even fed the lowly Dominique pecking around the farmyard. Cater to your Dominique’s foraging instincts. Provide them adequate runs with ample bugs, seed and pebbles. Of course, a little attention and a good layer food will pay rich dividends in egg and meat production. Keep the number of formidable Dominique roosters to a minimum. However, you may want to keep a sufficient number around to ward off predators and to propogate this endangered species. The name would suggest that they originally came from St. Dominique now known as modern day Haiti. However, breed historians also suggest European roots. The Dominique’s popularity has waxed and waned throughout their history. They grew quite popular during the early 19th century. 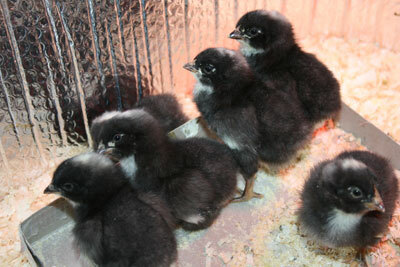 The American Poultry Association, also in its early stages of existence, declared the Dominque a breed in 1874. Asiatic breeds and the advent of the Plymouth Rock bred from the Dominique eclipsed the breeds popularity. Dominiques came to America’s rescue during the Great Depression by providing food for the homeless. By 1970 only four flocks and four people kept the Dominique from extinction. Today they have made yet another comeback but still remain on the watch list.